Some films seem to stand the test of time. Not only are they popular on release but they find new audiences throughout the decades that follow. Where Eagles Dare, first released fifty years ago this year, is one such example. 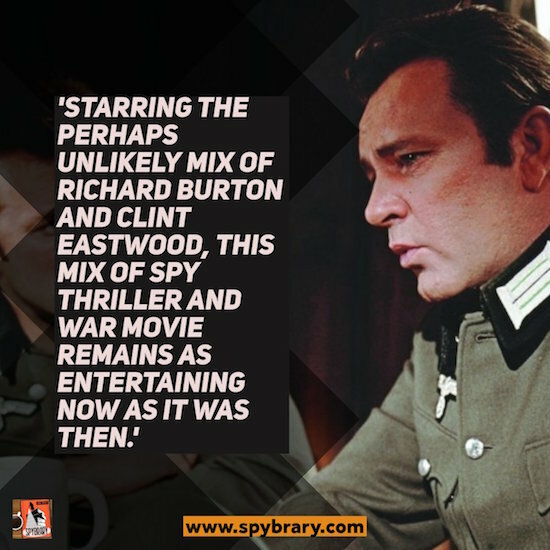 Starring the perhaps unlikely mix of Richard Burton and Clint Eastwood, this mix of spy thriller and war movie remains as entertaining now as it was then. A large part of it may be down to how Where Eagles Dare came out of a unique set of circumstances. Richard Burton, then at the height of both his fame following his marriage to Elizabeth Taylor and his talents as a thespian, found his stepson keen on seeing him in lighter fare than say The Spy Who Came In From The Cold. Following the success of films such as The Guns Of Navarone, a high adventure war film combining elements of spy fiction seemed to be in order. So Burton and producer Elliott Kastner turned to the man behind Navarone, Alistair MacLean. MacLean, however, had virtually nothing to sale them and instead found himself commissioned to write it from scratch. The story goes that the prolific writer delivered a draft a mere six weeks later and eventually novelized it as well into a bestseller still in print to this day. Those familiar with MacLean’s works will recognize many of the tropes at play. Agents on a secret mission during World War II, some of whom don’t see eye to eye, a traitor or traitors in the ranks, and a race against time. All of them are at play in the two and a half hours the film runs for, with intriguing results. First-time viewers will be in for the biggest treat perhaps as revelation piles atop revelation. Indeed the film’s plot that goes from a seemingly simple commando mission to an effort to root out traitors inside British intelligence seems (with a half-century’s hindsight perhaps) to owe more to the spy scandals of the early Cold War than from the Second World War fiction MacLean is working from on the surface. It’s also a piece of historical nonsense given later revelations but never let the facts get in the way of a good story, especially at a time when those facts aren’t known. Looking at Where Eagles Dare objectively, that is also the least of its plot problems. The film suffers from the inherent issue of featuring one plot twist after another: if you ever stop to think about it, it isn’t going to make much sense. MacLean’s plot becomes increasingly convoluted to the point of needing a lengthy scene about midway to two-thirds into the film so that Burton can untangle the plot by further tangling it. Plot-wise, the film is a house of cards ready to collapse if you assign logic to it. That isn’t a bad thing necessarily but something to keep in mind, especially on repeat viewings. 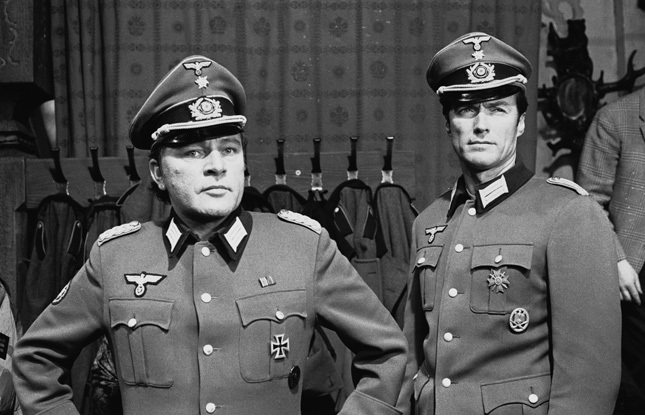 Richard Burton as Major Smith and Clint Eastwood as Lieutenant Schaffer. Chances are, however, that you’re watching the film for reasons other than the logic of its plot. Take, for example, its aforementioned unlikely leading men. Burton and Eastwood could not be more different as actors yet the two compliment each other nicely here. Burton’s Major Smith is the leader of the team: the man with a plan, playing games on multiple levels, and ready to talk at a moment’s notice whether its exposition or the iconic line “Broadsword calling Danny Boy.” Eastwood meanwhile offers a quieter, more brooding man of action as the American Army Ranger assigned to an otherwise all-British unit. The writing and direction play to their respective strengths though Burton engages in action pieces and Eastwood in more talkative scenes as they’re required. The two also bounce off of each other nicely with Burton seeming to enjoy pulling rank on the younger American who was on the brink of super-stardom at the time. The two of them in some ways make the movie what it is. They are just the front of a solid cast, however. A cast which also includes strong female roles in the form of agents Mary Ellison (Mary Ure) and Heidi Schmidt (Ingrid Pitt). Perhaps surprisingly for a film a half-century old, their roles in the plot hold up well as proper characters in their own right rather than as potential damsels in distress with Ure, in particular, getting a fair portion of action to do. Less surprising and a bit more stereotypical is the film’s portrayal of its German villains including Fredy Mayne as General Rosemeyer, Anton Diffring as Colonel Kramer, and Derren Nesbitt as Gestapo Sturmbannführer von Hapen. Of the three (and the seemingly countless extras playing assorted German soldiers) it is perhaps Diffring and Nesbitt who come out best with a rivalry between them that becomes a nice subplot. Rounding out the cast are Robert Beatty as an American general, Michael Hordern and Patrick Wymark as the Admiral and Colonel who send the team on their mission, with Donald Houston, Peter Barkworth, and William Squire as the other members of the team. Last but not least, it’s an action film. What stops viewers from considering the plot too much is one action set piece after another. Parachute jumps, hand to hand fights, gun battles, men dangling hundreds of feet in the air atop cable cars, chases and explosions. Where Eagles Dare has them all superbly staged and excitingly presented thanks to the combination of director Brian G. Hutton, editor John Jympson, and a rousing score from Ron Goodwin. Even after fifty years, the action sequences of the film hold up thanks to this combination of talents. 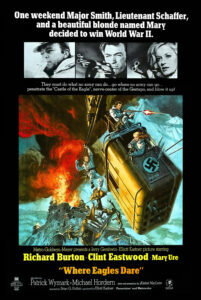 For all these reasons, Where Eagles Dare continues to captivate and enthrall a half-century after its original release. Though its plot might be convoluted, the talents at work and the way they bring Alister MacLean’s story to life make it ever watchable. After all, where else will you see Richard Burton and Clint Eastwood taking on Nazi soldiers and spies? May Broadsword call Danny Boy for many more years to come! Enjoy chatting about Spy books and movies? 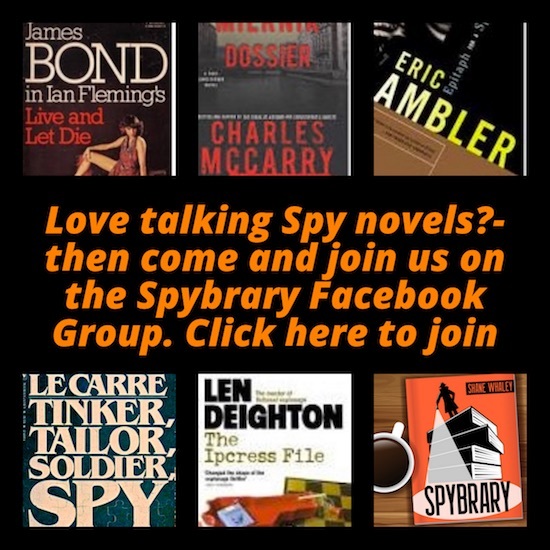 Come and join us on the Spybrary Listeners Facebook Group! Can anyone explain why the wires on the telegraph poles aren’t tripped by another vehicle before they escape in the bus? Apart from that, still watcheable after 50 years. I feel if I watch it enough times, I will eventually get the whole plot! What made the Corporal impersonating the American general volunteer for such a mission; to be tortured for information he doesn’t have?